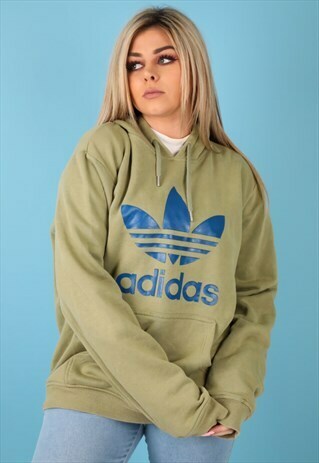 KEY DETAILS: Vintage Adidas Hoodie from the 90s. SMALL LIGHT STAIN near pocket area, therefore a discount has been applied. SEE SIZING AND CARE TAB FOR FULL MEASUREMENT MODEL SIZE AND FIT: Model Height 5 ft 6" // 168 CM. Model is Size Small // UK 8 // EU 36 // US 6. CONDITION: Item is in good vintage condition. THINGS TO KNOW: This item is a one off vintage piece, natural sign of wear and very minor marks should be expected. GET IN TOUCH: You can message us if you have any questions or follow us on Instagram at ADEGIRLCLOTHING and ADEWEARS to be the first to see NEW stocks and win great prizes.